Investor in Innovations® is a leading-edge and integrated Standard that offers a practical way for an organisation to assess, benchmark and validate its innovation capability. It is used by companies (e.g. BAE Systems, Panasonic, Raytheon, Thales), educational institutions (e.g. Plymouth University, City of Glasgow, South West College), and government agencies to measure their innovation gap and assess the health of their innovation portfolio. 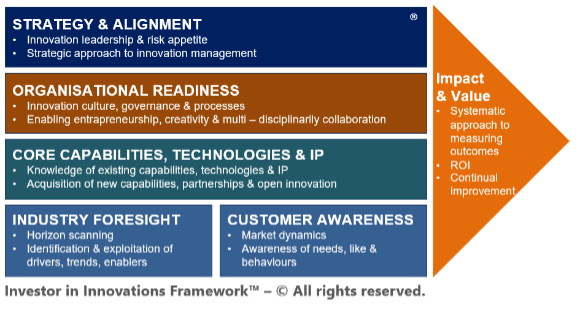 The Investor in Innovations® Framework offers a 360-degree diagnostic of an organisation’s innovation position through the eyes of its customers and stakeholders. It uses a well-defined six-category Framework: Strategy and Alignment; Organisational Readiness; Core Capabilities, Technologies and IP; Industry Foresight; Customer Awareness; and Impact and Value that generates a coherent and independently validated innovation profile for the organisation. A key outcome is an Action Plan to close organisation's innovation gap. In addition, the Accreditation Panel’s Recommendations Report together with input and guidance from the Innovation Council will form a strong basis for your innovation strategy. Achieving the Investor in Innovations® Award means that an organisation can demonstrate its strategic commitment to innovation and invest confidently to deliver differentiated value and economic benefit. The Investor in Innovations® standard was published in the prestigious Science in Parliament Journal. Click here to read the article. Public and private sector organisations large or small. Thus, recognising your organisation as one that invests in innovation successfully. In addition, the IKE Institute’s Certified Innovation courses offer a rich source for professional development in the innovation discipline to equip individuals, practitioners and business leaders to pursue their initiatives and future innovation assessments with confidence. Undergoing the Investor in Innovations® is not an arduous process. Guided by the IKE Institute Advisors, the accreditation process follows a structured and streamlined roadmap to ensure clarity and engagement by different participants and avoids unnecessary resource wastage. The accreditation is undertaken in multiple stages outlined below and is based upon a rigorous self-assessment process supported by an expert team of IKE Advisors. Upon successful achievement of the Investor in Innovations® accredited status, you will receive the Investor in Innovations® Certificate(s) together with the Award. The Investor in Innovations® Award lasts for 3 years with a monitoring of progress conducted annually. "Investor in Innovations made us look at ourselves and understand what we were doing. I3 raised our consciousness of what we do in innovation. Achieving the Investor in Innovation has helped to raise our focus on innovation. We are an engineering company and it is extremely important that we continue to innovate and it is also important that we don’t take it for granted! We have to continue to reinvent ourselves and how we do things. Investor in Innovations has also raised our profile within the organisation. The process of achieving the accreditation also showed up gaps and has given us some benchmarking. The benchmarking element is extremely valuable for us to continue to improve innovation." "Companies have to look hard at how to use their IP effectively, to protect or expand their existing markets, as well as create revenue streams from something that would otherwise be a passive asset. "Using the Investor in Innovations framework together with the expert guidance of the Advisors from the Institute of Innovation and Knowledge Exchange, has enabled us to identify further actions that enhance our approach to achieving total IP management, thus maximising the benefit of IP exploitation to our customers. We are pleased to be the first organisation in Singapore to embrace the Investor in Innovations standard." “We’ve been quite impressed, if not slightly startled about how thorough the whole process is and the quality of the peer review that come from other industry experts, so we found it a very valuable but challenging process and it’s helped us now build improvement plans to get even better at innovation." "This Invester in Innovations award is official recognition for the culture of innovation that TyneMet College nurtures in its staff and it students. Its new IGNITE Centre for Engineering and Innovation is a prime example of this. Providing the specialist training to embed the skills employers need from their workforce in fabrication, electrical engineering and welding is vital in filling posts in regional businesses. It will also make a telling contribution to the LEP's Strategic Economic Plan of creating more and better jobs for the North East economy."